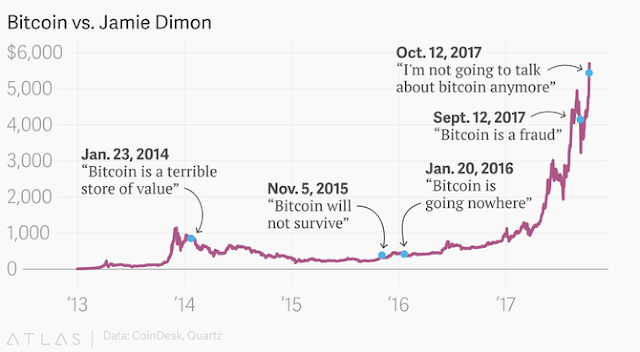 JP Morgan CEO Jamie Dimon is always in news by criticizing Bitcoin, right from 2014. Markets have found a correlation between Jamie Dimon's comments and the relative Bitcoin price movement which seems to be very interesting. Jamie Dimon is well known as a long-time critic of Bitcoin – he said that the cryptocurrency would "not survive" back in 2015 when the price was hovering around the $400 level. According to Jamie Dimon, people are very good at manipulating the press these days and getting news out. "The world economy's so big, JPMorgan alone, $6 trillion, we move all this money, and bitcoin in total, all these currencies, $50 billion dollars, maybe a billion dollars trades a day. People also say bitcoin is close to a fiat currency. Not really. A fiat currency is when a government says this is your legal tender, you have to give it and accept it." Jamie Dimon ended his talk at Institute of International Finance conference by saying that this would be the last time He talks about Bitcoin. He even admitted that his daughter too owns two Bitcoin!!. About James Dimon: He is the chairman, president and chief executive officer of JPMorgan Chase and previously served on the Board of Directors of the Federal Reserve Bank of New York. Dimon was named to Time magazine's 2006, 2008, 2009, and 2011 lists of the world's 100 most influential people. He was also named to Institutional Investor's Best CEOs list in the All-America Executive Team Survey from 2008 through 2011. Disclosure: I am long in Bitcoin from $1950. My first post about Bitcoin here, when it was trading at $1000.